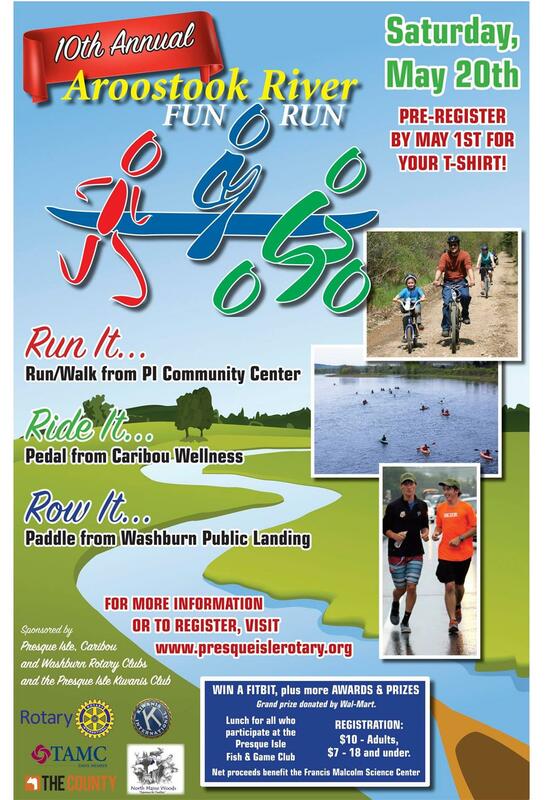 The Presque Isle, Washburn and Caribou Rotary Clubs and the Presque Isle Kiwanis Club are teaming up to present the 10th annual Aroostook River Fun Run, taking place this year on May 20. Registration will be under way from 8:30-9:30 and the race begins at 10 a.m. The registration fee is $10 for adults, $7 for 18 and under. T-shirts will be ordered for all who pre-register and pay by May 1. To register, check out the registration form here. Proceeds from this event will benefit the Francis Malcolm Science Center. This unique pedal-paddle-run event celebrates the natural beauty of our river and promotes activities as a fun and challenging family-oriented event. Because participants can choose to participate in this event in three different ways--by boat, by bike or on foot--there will be three different registration sites and start locations, though all participants will end in the same spot--the Presque Isle Fish and Game Club. The Kayak & Canoe registration and start will be held at Washburn’s Thomas Brewer Park. Biking registration and start will be at the Caribou Wellness Center (227-6678) for more information. The Running/Walking registration and start will be at the Sargent Family Community Center. At fun run's end, organizers will host an Award Ceremony and BBQ Lunch at the Presque Isle Fish & Game Club. For more information about this event, message the Presque Isle Rotary Club facebook page.